You’ve likely heard of Middle Child Syndrome. According to pop psychologists, middle children are often overlooked in favor of their elder and younger siblings. As a result, middle children are stereotyped as funny, class-clowning attention seekers. a real stick in the mud. As a writer, the phrase “rising action” should get you excited! It should mean that tension is building as the stakes grow increasingly higher for your imperiled characters. That said, in many early drafts, the tension Book One worked so hard to establish peters out in Book Two. 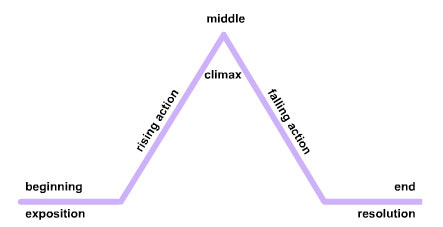 By virtue of staying in that one section of Freytag’s Pyramid, the main storyline is at risk of plateau and stagnation. If a writer isn’t careful, Book Two can develop a dragging pace, with little character or plot development. (Think of how many times you check your phone during the film version of Lord of the Rings: The Two Towers versus how hard it is to peel your eyes off the screen during Fellowship or Return of the King.) If Book Two is a dud, it might generate less reader interest in Book Three as a result. Freytag’s Pyramid, courtesy of Wikimedia.org. Suggestion #1: Does Your Story Really Need to be a Trilogy? Sometimes, a story is just not worth breaking into three separate parts. Skeptical? Put your reader cap on for a second. Each time that you as a reader finish a book, there’s a sense of an ending, right? Unless the writing throughout was phenomenal and the ending left you craving more, there’s an inherent inertia to purchasing the next book to pick up where you left off. Now, doff the reader cap and replace it with your writer’s hat. I like to think mine is a fascinator. Image courtesy of Monica Volpin, 2017. Check your outline and/or your first draft to make sure that you aren’t using Book One wholly for exposition, Book Two wholly for rising action, and Book Three just for climax and resolution. If this is the case, then you’re likely to: (1) info-dump and describe your characters in Book One to the extent that your reader gets bored; (2) bore yourself to the point that you don’t even want to write Book Two; and/or (3) fill Book Three’s page count by making your resolving plot points so dramatic as to be melodramatic. Instead, consider whether your story can be consolidated into one or two books tops. So long as each manuscript’s total word count maxes out around 90,000 words, you should be in fine fettle. Suggestion #2: Create Mini-Arcs (Subplots) in Each Installment. If you’ve put your foot down, your story must absolutely be a trilogy, then hey, fine, I surrender. We’ll go with your plan. In this case, make sure that each book in the series has its own “root to rise” in addition to the main story arc. To clarify my meaning, consider how boring it would be if you visited an amusement park and only rode one roller coaster. Or better yet, due to technical difficulties, how boring it would be if you got stuck on the same roller coaster. All. Day. Long. Instead of subjecting your reader to an excruciatingly slow climb and underwhelming fall, consider each book as its own ride. They’re all part of the same amusement park (i.e., your trilogy), but they each have their own thrills to offer. While the climb, peak, and fall in the first book might be akin to a kiddie coaster, the tension and the stakes should escalate in each book, including the second installment. Perhaps new information in the form of a plot twist, newly acquired skill set, or new character is revealed to completely flip the script and get the reader excited for Book 3 (with stakes the size of that blast coaster that you’re terrified of and thrilled for all at once). Suggestion #3: Rebel against Linear Progression. Conflict, as you know, is the engine of plot. With this in mind, consider that your conflict can have conflicts; in other words, your story doesn’t have to progress in a linear fashion. While Freytag’s Pyramid shows a clean progression up and down Plot Mountain, your characters’ journey might look more like an echocardiogram. As ProWritingAid suggests in its Novel-Writing Training Plan, small frustrations can make for interesting writing. Their fantastic example is that your heroine is rushing to her dying mother’s side but is waylaid by a funeral procession or locks herself out of the house. In other words, if your characters are walking somewhere and you’re going to spend a lot of time on the trail with them, a la Lord of the Rings, for the love of god, make sure something happens: they get lost, there’s a murder or rebellion, they meet giant tree people, anything. By following one or more of these suggestions, you should do your part to avoid Middle Book Syndrome, to the eternal gratitude of your readers. How have you inoculated your series against Middle Book Syndrome? If you have hints and tips, please share them in the comments below!